Outside the Box: A Very Happy Birthday to a Lovely Lady! I made this card for a very special lady for her birthday. The image is from Lexies and is absolutely gorgeous! Isn't she lovely? I coloured her with Promarkers and Flexmarkers and cut her out with a Spellbinders label die on one side. The background paper is from my stash and is some gorgeous vintage paper that I bought years ago, I added some pink pearlised paper to the right and layered the lace over it, the lace was from a shop in Cheltenham that I bought while on my travels! I used a Martha Stewart punch on the corners that I trimmed down and added pearls. The sentiment is my own. I thought it came out well so I wanted to share it with you, hope you like it! This is a gorgeous card Laurie, you've coloured the image in beautifully. This is gorgeous Laurian! Love how you've coloured the image and the layout. Just beautiful. Thank you for joining us over at the Scribble and Scrap Challenge and for using one of our images. Good luck. Beautiful card, Laurian! 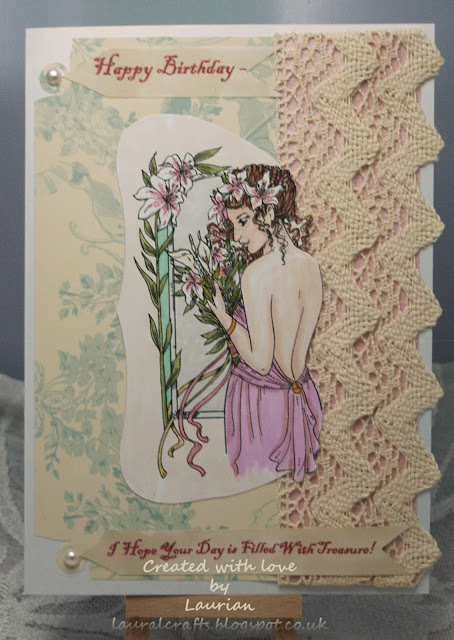 Gorgeously coloured image and loving the elegant lace border.